Code To FlowChart Converter 1.6 無料ダウンロード - Visualize the source code by generating the corresponding flowchart. It is also a very useful tool for program developers and document writers. By using Code to FlowChart Converter, programmers can easy access to get project overview, during the process of programming, programmers can preview their changed code structures at all times. In summary, it will be a great help for them to add new ideas into their source code. 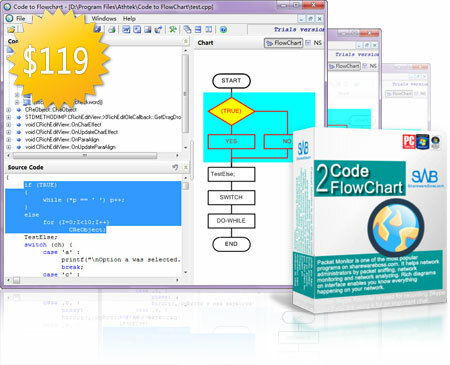 Code to FlowChart Converter presents the source code in a straightforward way. It provides document writers with visual diagram. We call them flowchart. Those flowcharts make a document writer a very clear mind which is very crucial on their writing. More than that, Code to FlowChart Converter supports to export flowcharts or NS charts to Visio, MS Word, XML, SVG, BMP (Bitmap) for further editing. You can easily add flowcharts or NS charts to your project documentation with no manual drawing required.